A day on the water, whether power boating, jet skiing or sailing, on the ocean, can be a lot of fun!!! But, the problem has been…what to do about all of that salt that gets all over everything!!! Everywhere you look, you can see pictures of equipment………… EXPENSIVE EQUIPMENT!!,….. that has been eaten up by salt! 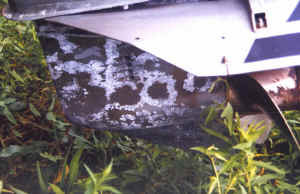 Whether it be metal trim, isinglas, sails, motors, trailers or faded paint, salt will destroy anything it gets on. 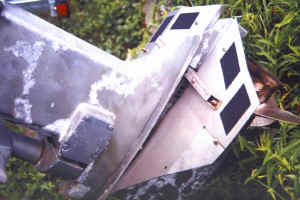 Notice The Corrosion & Salt Damage! 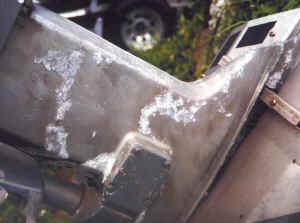 The Salt Buildup & Corrosion Is Starting To Damage The Outside Of The Motor! Wonder What The Inside Looks Like! The Salt In This Photo Is Working Hard To Destroy Your Motor! New Motors Are Quickly Affected By Salt! 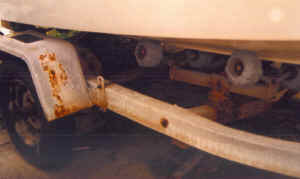 For A Few Cents Worth Of SALT-X The Trailer Below Would Not Have Been Damaged! SALT-X is a concentrated, rinsing and flushing agent whose sole purpose is to remove salt!! Not a cleaner or polish, SALT-X works quickly to remove even the harshest of salt build up from trim, bright work, fiberglass, motors, jet skis, sails, etc. ANYWHERE that salt is a problem! As aggressive as SALT-X is in removing even the harshest of salt buildup, laboratory tests and extensive field use have proven SALT-X to be NON-TOXIC & ENVIRONMENTALLY SAFE!! And, using SALT-X is simple! Just mix per label directions, rinse your boating equipment thoroughly or flush through your engine or jet ski and let air dry!!! It just doesn’t get any easier! 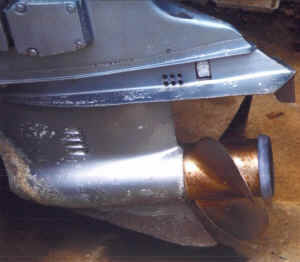 Flushing your outboard engine, outdrive or jet ski is a snap using our AUTO-MIX UNIT. Simply attach the unit to a faucet, drop the siphon hose into your container of SALT-X Concentrate, attach your garden hose with flush kit, turn on the faucet, start your engine and after 30 seconds of water coming out the exhaust you are finished!! NO rubbing, scrubbing or further rinsing required!! It’s that simple and easy!!! After flushing, simply remove the ear muffs, attach a standard nozzle, turn the water back on and using a wide angle spray, you can walk around rinsing your boat, boat lift, trailer, vehicle, boat sails, etc. The mobility of our AUTO-MIX UNIT and the fact that you are drawing from a central container, means you can rinse large areas with ease!! If your boat is too large to rinse every time you use it, keep a 3 gallon garden type sprayer on hand filled with SALT-X solution! Then you can keep those sensitive areas(cracks, crevices, etc.) rinsed and free of salt!! Unlike copycat product(s) on the market, SALT-X will not attack grease, oil, paint, waxes, rubber fittings or cause fading of paint or fabrics. SALT-X!!!!! SAFE!!!!! EFFECTIVE!!!!! ECONOMICAL!!!!! SALT-X!!! !